First, a word about the title: Why? Why do they call these books different things in different countries? And why did they leave poor Anne off of the title in The United States? Sigh, poor Anne. I believe that this is the first Morgan book I've ever read. I do think that if I'd have read any of his other work I would have rushed out to find the rest immediately. This book was excellent. Oh that Brontë family! The awful boarding school, the spoiled drunken brother, the deaths of such young sisters...the tragedies never ended for them. Only Charlotte lived to be 40, and she outlived her 5 siblings by years. Were the novels they ended up publishing to be expected because of their bleak lives? Or is it a miracle that they were able to write at all? 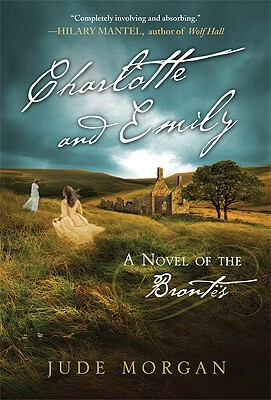 Keep in mind that this is a work of fiction, but it did bring the Brontë family to life for me. I enjoyed this very, very much and would recommend it to anyone interested in historical fiction or in the lives of the Brontë sisters. I love this review! I am so running out to get this book as soon as I can. In a Bronte vs. Austen showdown, I would back the Bronte family. And how are you typing their last name correctly? Lol. I hope you love it! I have to find the rest of the author's books too! I believe Jude Morgan is a pen name...hmmm. Oh! Forgot to answer your question! I'm copying and pasting because I have NO idea how to get that thingy above the e otherwise, lol. This looks really good--I'm definitely adding it to my TBR list! Thanks for the review. I'm so glad to hear you enjoyed this one. I'm definitely going to have to make a point of reading this one soon, especially since it has been sitting in my shelf unread since it was first released. This sounds so good to me, especially as I just finished reading Wuthering Heights and am now on Team Emily ;) It is rather odd that they left off Anne's name. Poor Anne, always forgotten :( After reading this one I want to read all of the Bronte stuff again..and soon! This one is new to me, and I'm really interested! I'll be adding it to my wish list. I don't know why they change the titles of books. It frusterates me when I can't find a book because the title changed. When I first heard about the book I was panicking a bit because I couldn't find it, lol. I'm glad I figured it out! I love the Brontes! I'll definitely have to check this out...although, being an Anne fan, I'm a little put off by the title! I hope you do Melinda, it's a good one! I wonder if there is a book out there JUST about Anne...she deserves it darn it. I agree with you about the title change - it's unnecessary and leaves out Anne, who does have her own role to play in the story. But I do like your cover better, so maybe it evens out. I want to read more by Morgan too, I might try his book about Shakespeare next. I did! I did! :D Thanks so much for the recommendation! He's got quite a list of books and I don't know how I've missed them all this time! Oo! This does sound good. I will have to check this one out. I've never understood the need for title changes either--and poor, Anne! She always seems to get the short end of the stick. I like historical fiction when it's about people who are familiar to me, so I suspect I'd like this book a lot. Same here :) I bet you'd like this one, it's a gem! This sounds like a neat book! To be honest, I don't know much about their actual lives, so I think I'd probably look into that before reading it so I could compare fact with fiction. This sounds awesome. And yes, where IS Anne? Anne deserves more love than she gets darn it! This book sounds great! I will have to add it to my ridiculously long to-read list!!! Ha ha, the towering pile..I totally understand! I am always leery about reading fictionalized novels about beloved authors, and the Bronte sisters count among my most beloved of authors. This one might have me changing my stance on that though. Thanks for a great review! Now I feel silly, this is The Taste of Sorrow? I guess that narrows down the list of Bronte books to read. Agreed - I'll never understand why they title books differently. If it's an issue of dialect or culture, just name the book something that will work generally. Glad you liked it. If they did write that way because of their lives then it feels awkward to say the books are favourites, yet in a way a nice tribute. See? This is why the whole different titles thing is so goofy! It confuses people! Poor Anne indeed. I found a huge compendium of Charlotte and Emily's novels at a secondhand book fair last month, 4 books in one huge volume, and not a word about Anne in the introduction, blurb or anywhere. She's still sort-of-canon rather than definite-canon. That's a good way to put it Alex, sort-of-canon. ;) Someone needs to write a book just about Anne. I'd read it!